It has been a few days since I last updated, and for anyone who was worried about us, I’m sorry to keep you hanging in suspense. As always, we are fine, just quite busy. Our time in Cape is drawing to a close, and as a result we are in a fervor to get so many things done (partially hastened by my procrastinatory nature). We had to get moving on our Nigerian visas, and like it or not, this would mean some trips to Accra to the Nigerian High Commission. We are headed to Nigeria for the last week of the month (hopefully) to work with UNICEF and see some of the measles outbreak that is going on there (and child health interventions taking place to try and stanch it — this year’s outbreak is tenfold larger than last year’s). To do that we’d need a visa to come back into Ghana for our plane flight home (Nigeria reportedly won’t grant your visa to there without proof you can leave), and then various other documents to apply for our Nigerian visa. Miranda took a day last week and went to Accra while I filmed in Cape, but the trip itself was a failure, mostly due to the slowness and/or ineptitude of the Ghana Immigration Service. Without recounting the entire trip, let me just point out a period where Miranda was told to “wait right here” for an official’s boss to come; Miranda sat for an hour, no one came, and when she finally inquired she was told “My boss came and I looked for you and didn’t see you.” This, I suppose, is the nature of government services in many, many places, so in a way we aren’t surprised. That said, it’s still annoying. In the end we were told the visa we need can be obtained at the airport when we travel back to Accra and that GIS won’t issue it now (without a 14 day turnaround). The Nigerian High Commission, unlike GIS, can do visa turnaround same day or two days. Official they do it in 2 days, although we saw several people get theirs same day. So there’s one plus. We got to Accra around 11am, after waking up at 5am to take the STC bus there. We spent the entire day (without having eaten, whoops) until after 5pm sitting inside the Nigerian High Commission. Unfortunately they do not allow electronics inside the High Commission premises, so there were several trips back outside the gates to make phone calls to procure more paperwork, then heading back in to wait, only to discover an hour later that it was not right, or had not come, and that the hour of intervening time could have been thirty seconds instead had we had our phones or laptop so our UNICEF contact could have reached us (or visa versa). In the end the correct documents were submitted, we were told to pay $260, and to come Thursday for our visas. We asked for a passport retention slip, or some receipt, and were told “don’t worry, I know you,” by the front desk receptionist. So hopefully we show up Thursday and all is well, since they have a few hundred of our dollars and both of our passports. We got breakfast/lunch/dinner all in one meal, and then headed to Kaneshi (I am sure I am spelling this wrong, but regardless of its spelling it is the hubbub-filled neighborhood in southern Accra where the trotro and Metro Mass buses queue for passengers). Our taxi ride to Kaneshi was the best ride we’ve had in our time in Ghana; the driver spoke really good English, and as a result we we able to converse on some topics that we had yet to mention to taxi drivers. The level of English fluency in Ghana varies widely, from older people or those more at the socioeconomic fringes who may not speak any English at all, to those who have had more formal (usually private school) education and are as fluent as any Briton. Virtually all taxi drivers can speak English in the sense that you can tell them where you need to go, and negotiate a price — although see previous posts of mine about the redenomination of money and how this causes issues with conceptializing numbers, “one five” might be $15, or it might be $1.5 — but possibly little else. With those who speak better English, we will often ask Fante/Twi words, or make the usual taxicab small talk. On rare occasions we find a driver who speaks really great English, and we can ask for his insights into various things. With this driver we discussed whether there are any female taxi drivers (there is one in Accra he personally knows, but she drives a very particular route). We talked about the gender bias in occupation of street sellers in Accra (e.g. women always sell oranges, men always sell cassava and Fan Milk, boys/girls/women sell water sachets, and so on) and his interpretations as to why each occupation has its particular preferred gender. The conversation wandered to many other topics, and in general it was really great; the trip was worth the price just for the ethnographic insight into life in Accra. We found a “four bus” or whatever they call them here (I am fuzzy on the name, we have heard it only twice), which is the same sort of bus we rode to Kakum in — it’s not a full sized 80-person bus, but it’s not a trotro either, it’s a sort of Chinese-made diesel bus that seats around 22. We waited about ten minutes and then the bus was off. Unfortunately there was still road construction going on (Miranda’s trip back last week took 7 hours instead of 3.5) and we spent 2 hours in traffic just to get out of Accra (keep in mind Kaneshi is at the border at the outskirts of urban Accra). After having slept only a few hours the night before, and now finding myself crammed into a small Chinese bus (I have yet to ride in a bus in Ghana where my knees weren’t pressed well into the seat in front of me) and crawling through traffic in stiffling heat, I meandered in and our of consciousness. I became fully conscious when we stopped after 2 hours to let everyone urinate at the edge of the road, right after we’d passed the construction. Unfortunately our hopeful logic would prove to be incorrect. Our driver did everything he could to make up for lost time, or maybe he just likes to swerve, pass illegally, and fail to slow for speedbumps. At the most ridiculous point we were illegally passing a vehicle that was illegally passing another vehicle, making for three-lanes-of-vehicles on a two-lane road. I probably should have known when our trip commenced with a group prayer — that is, the driver paused just before we set out, to say a prayer in Twi as the entire bus collectively bowed heads — that the trip was going to be interesting. We eventually got back into Cape Coast, caught a 2GHC taxi home, and passed out immediately upon entering our room. The intervening 2 days have been spent trying to wrap things up here, basically doing our own “mop up” of shots we aren’t quite happy with or little things we haven’t yet had time to film. Another two visits to Akatekyiwa, getting some shots of fisherman on the beach, and so forth. We interviewed Kennedy’s uncle in depth, which should make for good cinema as he has had an interesting life, and seems to have the most “wise” perspective of anyone I’ve met in Ghana. We spent some more time slacklining with kids in Akatekyiwa (at their request), as well as a few adults. So basically we’ve been mopping up, and saying our goodbyes. This is basically it — in a couple of days we’ll be in Nigeria, and then scarcely a week after that we’ll be back in the States. Cape Coast has really come to feel like home, and it seems almost cruel that just when we are really getting to know people, really feeling like this is where we belong, that we must leave. 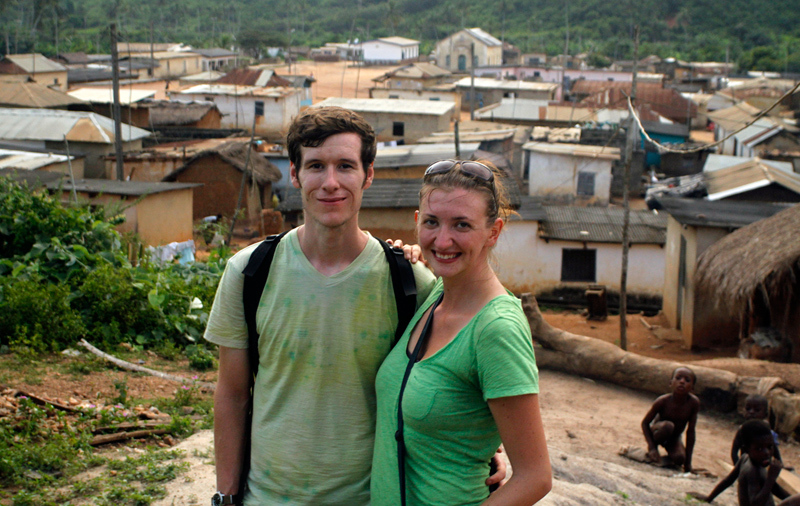 Everyone we have grown close to asks when we will be back, and I feel tormented that I don’t have a good answer and must simply say, “hopefully soon.” A year ago I certainly wouldn’t have guessed I’d be in Ghana right now, and knowing this I can also see there is no way to know when I’ll next be here. So when I’m saying goodbye to someone we’ve come to care about, it is especially hard to do so, knowing that this might be the last time I ever see him or her. We said goodbye (for the second time) to Kennedy tonight, and it was hard. He told us how much we’ve meant to him, and how we’ve inspired him, and we tried to tell him how special of a person he is, and how we can see that he has much to share with the world. We were helping him to get an e-mail address (using our netbook), so that we can keep in touch, and hopefully send him some information on furthering his studies, and as I was helping him to setup his gmail I felt extra proud of him; as we were traversing the various registration questions it was obvious how few of them applied to him (and many other Ghanaians). Security questions asking what your car’s registration tag is, or what street you grew up on (how many people here own cars? and how many streets have names? or for that matter, how many village homes are on streets?). That Google’s registration process so poorly fits his life experience I think is representative of how valuable that experience can be in informing his worldview. Kennedy truly knows how the majority of people in the world live, and by extension he is that much closer to understanding what is important to them, and how their lives could be improved. We gave him Miranda’s copy of Mountains Beyond Mountains, and I hope he can take it to heart, that he can see Western education as a tool for bringing a better life to those who need it most. Too many educated persons in poor countries fall pray to brain drain, and yet too many more never have the chance to become educated at all. I hope Kennedy can somehow thread the needle: to gain a valuable education, whether in the US, in Ghana, or simply from books and experience, and use it to help his countrymen. It is clear to us he has the desire to do much in life, but is precluded by the predicaments of structure that limit so many in poor countries. Miranda and I are having a goodbye dinner of Pizza at the nearby gas station (only in Ghana would the best food we’ve had so far be served at a gas station restaurant) as it thunders outside. Lightning knocked out the power here a few minutes ago, but the various conversations in the room hardly skipped a beat as the entire restuarant chatted in the dark. In an hour or so we’ll be back home, packing before a few hours of sleep and a hopefully quick but productive trip to Accra tomorrow. We’re off to Accra to meet with the Red Cross, WHO, Nigerian High Commission, and hopefully be back in Cape by nightfall (with Nigerian visas in hand). The plan is to shoot more stuff in Cape on Friday (saying goodbye to Elizabeth and the girls we’ve been living with), and then off to Accra to fly to Lagos (and then Lagos to Abuja). I fear I’ll be too busy to post much over the next few days, so mentioning what we’re planning is maybe the next best thing. 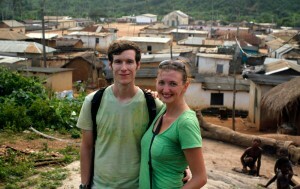 In the photo at right Miranda and I are posing on a hill overlooking Akatekyiwa. This entry was posted on Wednesday, November 17th, 2010 at 10:56 pm. It is filed under Blog - Adam and tagged with Akatekywa, Cape Coast, Ghana. You can follow any responses to this entry through the RSS 2.0 feed.